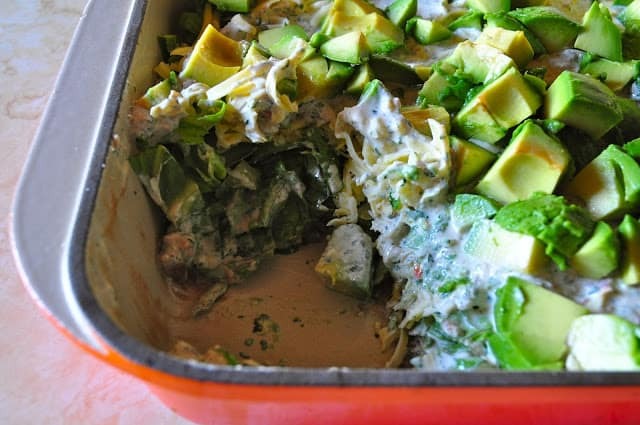 7 Layer Burritos are one of my favorite summer ‘quick to prepare’ recipes. Make it in the morning, let it meld all day, 5 minutes of work at dinner time and wham dinner is served. It started life a few years ago as the ubiquitous seven layer taco dip, which it still essentially is, but I’ve worked on the sour cream layer and I don’t serve it with chips. I serve the ice cold dip with steaming hot flour tortillas. Chips have a half-life of 7.3 seconds in this household. They come in and go out just as quickly. It’s as if once chips enter they have mind control and the only thing anyone wants is chips until they are gone. To make life bearable and to ensure my kids eat fruit and vegetables, chips are a rarity(like Sasquatch!) in our house. 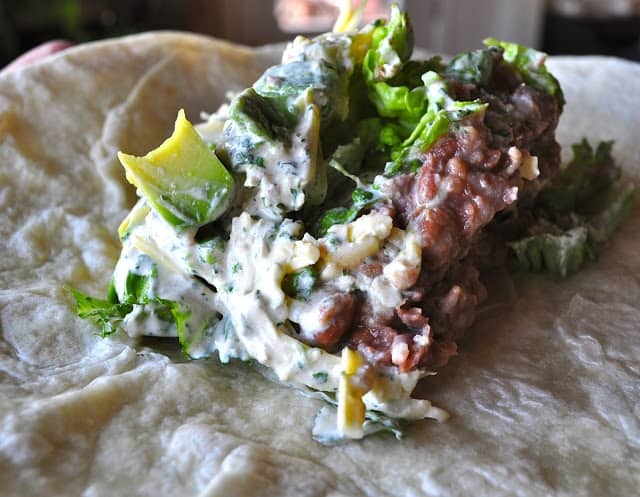 Eating this dip folded into burritos makes so much more sense. And it’s vegetarian too! We love Hot and Cold Burritos, yet somehow I have managed to not make them for two years! When I made them today it was like they were a brand new beast. Thankfully everyone still loved them and practically licked the pan clean. I don’t know it must be summer but my kids will not stop eating how about yours? I LOVE Burritos, and your recipe looks great! I've shared a recipe super easy flax meal sandwich bread that is gluten and egg free (but naturally so, it doesn't require fancy gf ingredients). Very healthy and easy to make. Never thought of cold burritos what a fabulous idea. I just learned about your party thanks to 21St century housewife. Will keep in touch. Hi thanks for hosting! Today I'm sharing #1 in my scratch marinara series – roma tomato, roasted red pepper & basil. We are a cycling & running household so we eat a lot of pasta! I was tired of buying jarred marinara with mystery ingredients and dismayed when I couldn't find a scratch recipe that didn't contain canned ingredients, so I created my own. Enjoy! I like your comment about chips having a half life of 7.3 seconds. That's about average right now, with the small family home, and decreases with the return of more of the big kids!